People used to always think that Gloria Swanson was the real life inspiration for her character on Sunset Boulevard because she embodied the character so completely. However, what is far more likely is Mary Pickford. But it's important to remember that Norma Desmond did not describe her completely in the way that she was not just America's Sweetheart. She was powerful and intense and one of the first studio owners (United Artists) who had control over her career in a way that few women even currently do, making decisions about her directors, writers and her image in general. She's one of the more fascinating women of early film, who often gets overlooked because she had such an innocent image and people often overlook how complex she was. But for those years that she reigned in Hollywood, she was a powerhouse. She was active in film from 1909 to 1933, often playing children even into adulthood in a way that does not translate well after the silent era. 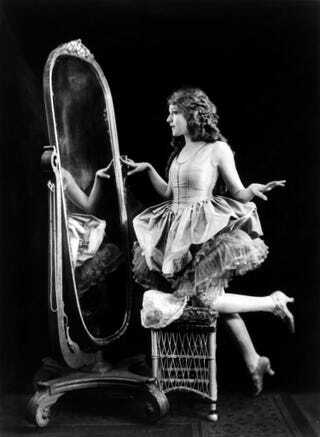 Mary started out as a child actress at age six touring in Vaudeville shows. She starred in her first flicker at age 17 but her star did not begin to ascend until the mid-teens when she became the most powerful female star, mostly on the strength of her films where she played a sweet adolescent looking for love. Tess of the Storm County—at the height of her fame. In the 20s, with her husband, Douglas Fairbanks, Mary Pickford reigned over Hollywood from her Pickfair estate, making a film a year. She found success easily through the 20s but like so many silent stars who were identified with an era, when talkies began to become popular, her star declined and she made few films, until her last in 1933. Mary Pickford adopted two children and retreated into private life but was trailblazer, if not just for her acting abilities but for the fact that she understood the business of being a star. And enjoy this CBC Radio interview in 1959 that is a wonderful retrospective of her career.